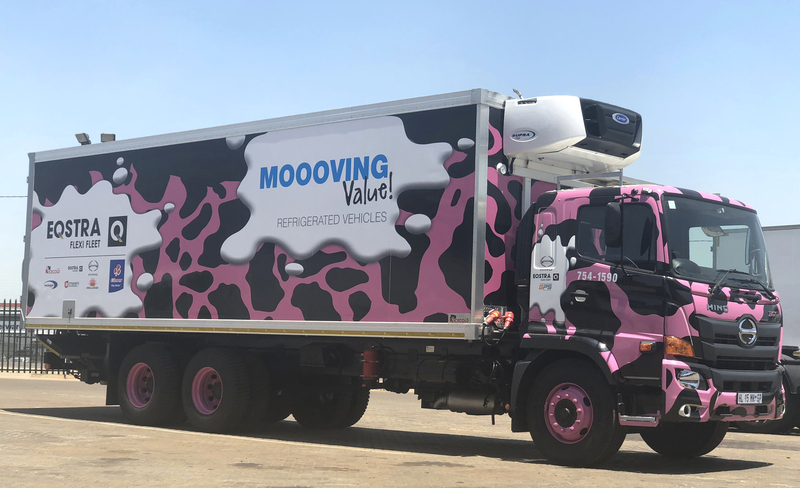 Apart from its good looks, this rigid refrigerated vehicle launched by Eqstra Flexi Fleet embraces a host of new technology to power the refrigeration unit. It stands as an example of excellence via partnerships. The partnership was between Eqstra Flexi Fleet, a division of Eqstra Fleet Management and Logistics, Pecsser & Carrier, Ice Cold Bodies, Hino South Africa and GEA with the objective of designing a rigid refrigerated vehicle featuring new technology to power the refrigeration units. This technology has been designed and engineered to meet the challenges of rough terrain, long distances and high ambient temperatures encountered in the SADC Region. Unveiling the new technology Jacqui Carr, CEO of Eqstra Fleet Management and Logistics (EFML), said that it was part of the company’s strategy to keep ahead of current technology to offer customers the most sophisticated and up-to-date systems to ensure increased efficiencies and subsequent cost savings in the day to day operation of their fleets.